We’ve written before on the subject of mindfulness, here and here. However, since awareness and practice of it has been growing seemingly by leaps and bounds, another warning regarding that system is probably a good idea. Time recently published a special edition that deals completely with the area of mindfulness. Though the cover price was $13.00, it was beneficial to understand the spin placed on this growing problem. 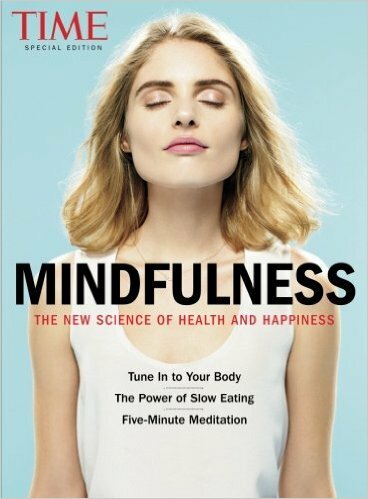 First thing to notice is that right on the cover, Time calls mindfulness, “the new science of health and happiness.” Whenever something like mindfulness is referred to as “science,” red flags should go up. After all, mindfulness is dealing with the area of philosophy, but is presented in a way that is intended to make people believe that it is based in hard, cold, scientific fact. It’s not. It used to be called Mindfulness of Purpose, but has been shortened to simply mindfulness. That is also a clue. Often, names and labels are changed completely or shortened to make them more scientific sounding, so that people will have a difficult time disagreeing with them. A clear-cut example of this is in the area of Global Warming. The emphasis then was on the alleged fact that the air around the earth and the earth itself was heating up (“warming”). Since it was becoming clear to many that the polar ice caps were not melting and aren’t in any danger of melting, the name was changed from Global Warming to Climate Change. How can any intelligent person disagree or argue against the fact that the climate of the earth is always in flux? Unfortunately, the term Climate Change misses the point entirely since it is simply another term for Global Warming. It seems that this is the way many things on the left occur. There is such a push by leftists to portray something as actual fact when in reality, all too often, there is a dearth of missing truthful information yet the push to accept something as fact is continued in spite of the questions. The same type of questions should be asked when Time (or any other organization) attempts to push something as fanciful as mindfulness as a science. In Time’s Special Edition on Mindfulness, there are 96 pages of information pushing the repackaged Transcendental Meditation. The book is divided into three parts. Can you Think Yourself Well? …So Give Yourself an I-Break! Can You Shed Pounds on a Mindfulness Diet? As can clearly be seen, the subject of mindfulness collides with Transcendental Meditation and Yoga. We are to believe that all of the above points in the outline are attainable simply through the process of thinking purposefully. This is essentially what mindfulness (or any other aspect of TM/Yoga), is all about. It is being centered or focused on the now. Mindfulness is a system whereby people are taught to do things with purpose, to be in the moment. If you’re sitting, do it with purpose. If you’re standing, do it with purpose. If you’re eating, do it with purpose. Another way of putting this is to live in the moment. There is nothing wrong with living in the moment and in fact, it is normally how Jesus lived His life, moment-by-moment communication and submission to the Father’s will. This is how we are to live our lives as well. We are to be mindful (or aware), of life as we live it. The problem though is that for those pursuing mindfulness, from a secular perspective, the techniques used include transcendental meditation, Yoga, breathing exercises, and other components of Eastern Mysticism, all designed to help fully relax a person, allowing them to be more intentional. For the Christian, this is not the way to achieve a living-by-the-moment lifestyle. The Christian’s constant communication and submission to God is the path by which we become more purposeful in living our Christian lives, for God’s glory. The ultimate purpose of Mindfulness is to “clear” the mind. “Clearing your mind can also lead to deeper thinking, reveals a new study published Psychological Science.”  Clearing the mind unnecessary thinking and minutiae is said to allow a person to actually be a better critical thinker. Of course, for this to exist, a person must already be a critical thinker to some extent. Proponents of mindfulness ultimately believe that the reason people are often frazzled, unable to truly focus is because they are stressed out. It would seem that many to most people in society are stressed out because of the many pressures they face in life. Even though it was claimed that more technology would provide a more efficient and effective lifestyle, this really hasn’t been the case. Today, people have become involved with their technology. Look around. People are constantly on their phones, either making calls, posting or reading comments on social networks, or playing games. It is amazing how many drivers use their phones while they drive even though research has proven it is dangerous, even if using the phones in a hands-free mode. Too many people in society have become completely distracted today. While people can do multiple things at a time at the rate that people try to do so many things at the same time simply creates more stress than it reduces. The person who first coined the term “mindfulness” was Jon Kabat-Zinn, a biologist who, in the 1970s identified mindfulness as a “state of mind: the act of ‘paying attention on purpose’ to the present moment, with a ‘non-judgmental’ attitude.” Who wouldn’t want to live like that? The goal is certainly a good one. Mindfulness is claimed to be a system that can help people outsmart stress and provide peace. “Mindfulness is about putting down our juggling balls for a little bit. It’s about embracing the beauty of monotasking.”  This sounds all well and good, but again, since mindfulness is simply another name for Transcendental Meditation (TM) or Yoga, it creates the same problems that these systems create. Ultimately, these systems open practitioners to the powers of darkness, Satan himself. As stated in previous articles, the goals of Yoga/TM are not innocent. Located in the middle of our forehead, about where the pituitary gland is, the third eye is in the centre of our sixth chakra (anja chakra). Many yoga practices focus on opening this eye, so we can ‘see’. To see means to become aware of the vast amounts of information available to us that don’t necessarily come through our other five senses. Those who can use their third eye are sometimes called “seers” or simply… “see-ers”. It is astonishing today how blind most people seem to be. Whether it’s the reality of problems associated with unchecked Muslim migration to the seeming benevolence of systems like mindfulness, society has gone astray. People have been consistently moving away from truth for decades and the results of that move have come home to roost. Today, it is becoming more difficult for the average person to discern truth at all because determining truth for most means determining how a person feels about something. This is no way to determine truth at all! Like everything else, using a system like Mindfulness can and will progress an individual to deeper and more organic phenomenon that end up engaging the practitioner in all manner of error. No one starts out never using drugs and starting with heroin. Usually, they start with something far more seemingly innocuous, like pot. But our systems can easily get used to one thing and stop reacting as it used to, which often forces a person to move onto something stronger. From pot, to cocaine, to possibly heroin or worse are natural steps for people who eventually become addicted and chained to drug use. The same really applies with anything. People who have never committed a crime in their life do not wake up one day and proclaim, “I’m going to rob a bank today!” and then do it. Moving toward that lifestyle is often done incrementally. The same holds true of people who move off into the realm of transcendental meditation or Yoga. It really doesn’t matter what it’s called as all of it – including mindfulness – is rooted in Buddhist beliefs. These practices open people up to the spiritual world and the beings who exist there. It opens the door to their direct interference and influence in a human being’s life. I have books in my library like “Seth Speaks,” showing how people have been literally overtaken by these demonic entities and their lives were changed forever. In fact, in many cases, these people die completely worn out and used up, mere shells of humanity. Those around them have noted the change and it was not for the better. Christians need to be especially careful these days because of the increase of demonic activity as the time moves toward the final seven-years of human-led history, the Tribulation. These demons are out to collect and capture people’s lives, to live through them in service to Satan. It is one thing to simply “meditate” or think seriously about God’s Word. Every Christian needs to be reading God’s Word every day and we need to be in constant communication with God because we have that right as Christians and because He knows we need to be connected to Him in order to spiritually and truly thrive while we are in this world. As we do this, our commitment to God grows, our willingness to submit to His revealed will (in His Word) becomes more clear and pronounced because He lives within us. God is the only “power” we should be opening ourselves up to while we move through this life. By using things like Mindfulness, we are actually opening ourselves to powerful dark forces within the spirit world. Once they latch on, they’re not willing to go easily. There is nothing wrong with thinking about or even contemplating Scripture. Unfortunately, the main purpose of using humanistic systems to achieve a state of mindfulness is something that actually falls under the banner of witchcraft or shamanism. It is using “spiritual forces” to help achieve higher learning or gain an embodiment of self-knowledge. These things need to be rejected. Many of these things have been taught by people for decades and interestingly enough, over the past few decades, even “aliens” are said to now be teaching them to willing recipients on earth. The message is always the same regardless of the source though. Reject the false and anti-God premises of Mindfulness, Transcendental Meditation, Yoga and all other forms of Eastern Mysticism. For the Christian, they especially have nothing good to offer. Avoid them like the plague. Entry filed under: Agenda 21, alienology, Atheism and religion, christianity, Cultural Marxism, Demonic, devil worship, Eastern Mysticism, emergent church, Emotional virtue, eternity, Global Elite, Political Correctness, Politically Correct, Politics, Religious - Christian - End Times, Religious - Christian - Prophecy, Religious - Christian - Theology, salvation, Satanism, second coming. Tags: buddhism, chakra, contemplative practices, contemplative prayer, contemplative spirituality, demonic activity, Eastern Mysticism, meditation, mindfulness, monotasking, pineal gland, pituitary gland, religious traditions, seth speaks, spiritual world, stoicism, taoism, third eye, transcendental meditation, yoga.